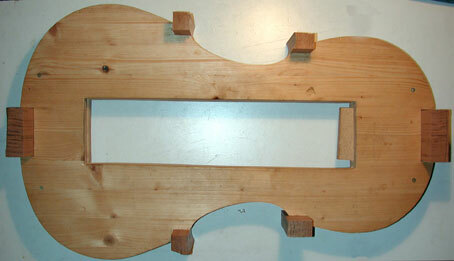 Many violin builders use molds to construct an instrument. The mould is equivalent to the inner outline of the instrument without the ribs. It is called a mold because this form corresponds to the shape of the instrument without the ribs. The mould can be used repeatedly and enables the violin builder to always have a constant outline with which to work. A cutaway for the four corners and ribbing above and below is prepared. These side rib openings are cut to correspond to the side mounting and serve as an overlay for the glue. As soon as the back is glued, the mold is removed through bellys top.